Pumpkin bread is a great go to fall treat. 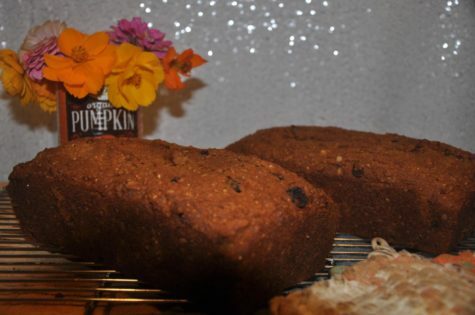 This recipe makes two loaves of raisin pumpkin bread for readers to enjoy. With fall and holidays fast approaching, many cannot stop thinking about and craving all things pumpkin. While pumpkin pie is great, it is almost always reserved for Thanksgiving in my family, and pumpkin spice lattes don’t really hit the spot – so pumpkin bread is my go-to fall treat. Even better than plain old pumpkin bread is pumpkin bread with a twist, including the recipe I’ve listed below: Raisin Pumpkin Bread. Grease and flour two medium loaf pans. 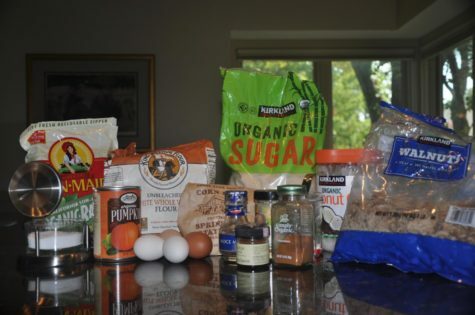 Stir together the flour, cornmeal, baking soda, ginger, cinnamon, cloves, nutmeg and salt. In a separate bowl, beat coconut oil and sugar until blended. Beat pumpkin, eggs and water. Combine ingredients and beat until blended. Mix in raisins and walnuts. Pour into the two pans, and bake for 60-65 minutes.